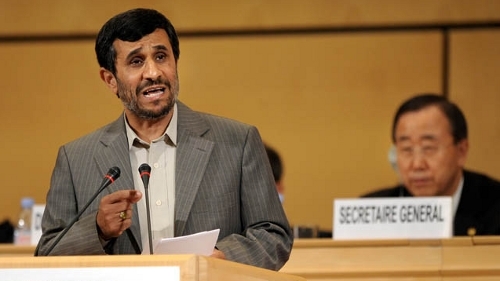 This is a rush transcript of the Iranian President Mahmoud Ahmadinejad's remarks at the United Nations Durban Review Conference on racism in Geneva, Switzerland, on April 20, 2009. Transcribed from the translation given in the U.N. webcast of the speech. In the name of God, the Compassionate, the Merciful... [Protestors in clown costumes escorted out by security] May he bestow upon his prophets... Praise be upon Allah, the Almighty, who is just, kind, and compassionate. May he bestow upon his prophets his blessings and his grace from Adam to Noah; Abraham, Moses, Jesus Christ, and His last prophet, Mohammed. Peace be upon them all who are the harbingers of monotheism, fraternity, love ... [Applause] ... human dignity and justice. Mr. Chairman. I call upon all distinguished guests to forgive these ignorant people. In the name of God, the Compassionate, the Merciful. Praise be upon Allah, the Almighty, who is just, kind, and compassionate, and praise and salutations of the Almighty God to the great prophet. May he bestow upon [us] His blessings, His grace. We thank the Almighty God. Praise be upon him who is just and who is compassionate. And the salutations and regards of Allah to his prophets, from Noah to Abraham, Moses, Jesus Christ, and his last prophet Mohammed. Peace be upon them all who are the harbingers of monotheism, fraternity, love, human dignity, and justice. Mr. Chairman. Honorable Secretary General of the United Nations. Madam High Commissioner. Ladies and Gentleman. We have gathered here in the follow up to the Durban conference against racism and racial discrimination to work out practical mechanisms for our holy and humanitarian campaigns. Over the last centuries, humanity has gone through tremendous suffering and pain. In the middle ages, thinkers and scientists were sentenced to death. It was then followed by a period of slavery and slave trade, when innocent people in millions were captivated and separated from their families and loved ones, to be taken to Europe and America under worse conditions; the dark period that also experienced occupations, lootings, and massacres of innocent people. Many years passed by before nations rose up and fought for their liberty and freedom, and they paid a high price. They lost millions of lives to expel the occupiers and proclaim their independence. However, it did not take long that the coercive powers imposed two wars in Europe which also plagued a part of Asia and Africa. Those horrific wars claimed about 100 million lives and left behind massive devastation. Had lessons been learned from the occupations, horrors, and crimes of those wars, there would have been a ray of hope for the future. The victorious powers called themselves the conquerors of the world while ignoring or downtreading the rights of other nations by the imposition of oppressive laws and international arrangements. Ladies and gentlemen, let us take a look at the U.N. Security Council, which is one of the legacies of World War II and World War I. What was the logic behind their granting themselves the veto rights? How can such a logic comply with humanitarian or spiritual values? Could it be in conformity with the recognized principles of justice, equality before law, love, and human dignity? [Applause] Or rather, with discrimination, injustice, violation of human rights, or humiliation of the majority of nations and countries? That Council is the highest decision-making world body for safeguarding the international peace and security. How can we expect the realization of justice and peace when discrimination is legalized and the origin of law is dominated by coercion and force rather than by justice and the right? Coercion and arrogance is the origin of oppression and wars. Although today many proponents of racism condemn racial discrimination in their words and in their slogans, a number of powerful countries have been authorized to decide for other nations based on their own interests and at their own discretions. And they can easily ridicule and violate all laws and humanitarian values, as they have done so. The Security Council helped stabilize this occupation regime and supported it in the past 60 years, giving them a free hand to continue their crimes. It is all the more regrettable that a number of Western governments and the United States have committed themselves to defend those racist perpetrators of genocide whilst the awakened conscience and free minded people of the world condemn aggression, brutalities and bombardments of civilians in Gaza. They have always been supportive or silent against their crimes. And before that, they have always been silent with regard to their crimes. Distinguished delegates, ladies and gentlemen, what are the root causes of U.S. attacks against Iraq or invasion of Afghanistan? [Shouts from audience] What are the root causes of U.S. attacks against Iraq invasion of Afghanistan? Was the motive behind the invasion of Iraq anything other than the arrogance of the then U.S. administration and the mounting pressures on the part of the owner of wealth and power to expand their sphere of influence, seeking the interests of giant arms manufacturing companies, affecting a noble culture with thousands of years of historical background, eliminating potential and practical traits of Muslim countries against the useful Zionist regime, or to control and plunder energy resources of the Iraqi people? Why, indeed almost a million people were killed and injured and a few more millions were displaced and became homeless. Why, indeed the Iraqi people have suffered enormous losses amounting to hundreds of billions of dollars. And why was hundreds of billions of dollars imposed on the American people and its allies as a result of these military actions? Wasn't the military action against Iraq planned by the Zionists and their allies in the then U.S. administration in complicity with the arms manufacturing companies and the owner of the wealth? The invasion of Afghanistan; restore peace, security, and economic well being in this country. The United States and its allies not only have failed to contain [?] in Afghanistan, but also the illicit cultivation of narcotics multiplied in the course of their presence. The basic question is: What was the responsibility of the job of the then U.S. administration and its allies? Did it represent the world? Have they been mandated by them? Have they been authorized on behalf of the people of the world to interfere in all parts of the globe? And of course mostly in our region aren't these measures a clear example of egocentrism, racism, discrimination, or infringement upon the dignity and independence of nations? Ladies and gentlemen, who are responsible for the current global economic crisis? Where did the crisis start from? From Africa? From Asia? Or was it first from the United States, then spreading to Europe and to their allies? For a long time they imposed inequitable economic regulations. By their political power on the international economy they imposed a financial and a monetary system without a proper international oversight mechanism on nations and governments that played no role in the repressive trends or policies. They have not even allowed their people to oversee of monitor their financial policies. They introduce all laws and regulations in defiance to all moral values only to protect the interests of the owners of wealth and power. They further presented a definition of market economy and competition that denied many of the economic opportunities that could be available to other countries of the world. They even transferred their problems to others whilst the wave of crisis lashed back, plaguing their economies with thousands of billions of dollars in budget deficits. And today, they are injecting hundreds of billions of cash from the pockets of their own people into the failing banks companies and financial institutions making the situation more and more complicated for the economy and their people. They are simply thinking about maintaining power and wealth. They couldn't care any less about the people of the world and even about their own people. Mr. President, ladies and gentlemen, racism is rooted in the lack of knowledge concerning the truth of human existence as the selected creature of God. It is also the product of his deviation from the true path of human life and the obligations of mankind in the world of creation. Failing to consciously worship God, not being able to think about the philosophy of life or the path to perfection that are the main ingredients of divine and humanitarian values, have restricted the horizon of human outlook, making transient and limited interests a yardstick for his actions. That is why the cells of the Devil's power took shape and expanded its realm of power by depriving others from enjoying equitable and just opportunities to development. The result has been the making of an unbridled racism that is posing the most serious threat against the international peace and has hindered the way for building peaceful coexistence in the entire world. Undoubtedly, racism is the symbol of ignorance which has deep roots in history. And it is indeed a sign of frustration in the development of human society. It is therefore crucially important to trace the manifestations of racism in situations or in societies where ignorance or lack of knowledge prevails in the societies. This increasing general awareness and understanding towards the philosophy of human existence is the principle struggle against such manifestations; which is the key to understanding the truth that humankind centers on the creation of the universe, and the key to a return to the spiritual and moral values, and finally the inclination to worship God the Almighty. The international community must initiate collective moves to raise awareness in the afflicted societies where the ignorance of racism still prevails so as to bring to a halt the spread of these malicious manifestations. Dear friends, today the human community is facing a kind of racism which has tarnished the image of humanity in the beginning of the third millennium. The world Zionism personifies racism that falsely resorts to religion and abuse religious sentiments to hide their hatred and ugly faces. However, it is of great importance to bring into focus the political goals of some of the world powers and those who control huge economic resources and interests in the world. They mobilize all their resources, including their economic and political influence and world media to render support in vain to the Zionist regime, and maliciously endeavor to diminish the indignity and disgrace of this regime. This is not simply a question of ignorance, and one cannot conquer this ugly phenomenon through cultural campaigns. Efforts must be made to put an end to the abuse by Zionists and their supporters of political and international means and respect of the will and aspirations of nations. Governments must be encouraged and supported in their fights aimed at eradicating this barbaric racism [applause] and to move towards reforming ... [applause] ... the current international mechanisms. There is no doubt that you are all aware of the conspiracies of some powers and Zionist circles against the goals and objectives of this conference. Unfortunately, there has been literature and statements in support of Zionism and their crimes, and it is the responsibility of honorable representatives of nations to disclose these campaigns which run counter to humanitarian values and principles. It should be recognized that boycotting such a session as an outstanding international capacity is a true indication of supporting the blatant example of racism. In defending human rights it is primarily important to defend the rights of all nations to participate equally in all important international decision making processes without the influence of certain world powers. And secondly it is necessary to restructure the existing international organizations and their respective arrangements. Therefore this conference is a testing ground and the world public opinion today and tomorrow will judge our decisions and our actions [applause]. Mr. President. Mr President. Ladies and gentlemen. The world is going through fundamental changes, radical fundamental changes. Power relations have become so weak and fragile. The sounds of cracks in the pillars of world oppression can now be heard. Major political and economic structures are at the brink of collapse. Political and security crises are on the rise. The worsening crises in the world economy for which there can be seen no bright prospect, amply demonstrate the rising tide of far reaching global changes. I have repeatedly emphasized the need the change the wrong direction in which the world has been managed today. And I have also warned of the dire consequences of any delay in this crucial responsibility. Now, in this [?] and valuable event, I would like to announce here to all leaders thinkers, and to all nations of the world present in this meeting and those who have a hunger for peace and economic well being, that the management, the inequitable and unjust management of the world, is now at the end of the road. This deadlock was inevitable since the logic of this imposed management was oppressive. The logic of collective management of world affairs is based on noble aspirations which centers on human beings and the supremacy of the Almighty God. Therefore it defies any policy or plan which goes against the interest of nations. Victory of the right over the wrong and establishment of a just world system have been promised by the Almighty God and his messengers and it has been a shared goal of all human beings from different societies and generations in the course of history. Realization of such a future depends upon the knowledge of the creation and the belief in the hearts of all the faithful [applause]. The making of a global society is in fact the accomplishment of a noble held in the establishment of a common global system that will be run with the participation of all nations of the world in all major and basic decision making processes and the definite route to this sublime goal. Scientific and technical capacities as well as communication technologies have created a common and wider spread understanding of the world society and has provided the necessary ground for a common system. Now it is incumbent upon all intellectuals, thinkers, and policy makers in the world to carry out their historical responsibility with firm belief to this definite route, I also want to lay emphasis on the fact that the western liberalism and capitalism, like communism, has reached to its end since it has failed to perceive the truth of the world and human[kind] as it is. It has imposed its own goals and directions on human beings with no regard for human and divine values, justice, freedom, love, or brotherhood; has based the living on the intensive competition securing individual and collective material interests. Two: Mindful of the inefficacy of the current international political, economic, and security systems on the world scene, it is necessary to focus on the divine and humanitarian values and by referring to the true definition of human beings, and based upon justice and respect for the rights of all people in all parts of the world, and by acknowledging the past wrongdoings in the past dominant management of the world undertake collective measures to reform the existing structures. In this respect, it is crucially important to reform the structure of the Security Council, including the elimination of the discriminatory veto right ... [applause] ... and change the current world and financial monetary systems. It is evident that lack of understanding on the urgency for change is equivalent to the much heavier costs of delay. Dear friends, be aware that to move in the direction of justice and human dignity is like the national rapid flow in the current of a river. Let us not forget the essence of love and affection, the promised bright future of human beings is a great asset that will serve our purpose in keeping us together to build a new world and to make the world a better place full of love fraternity and blessings; a world devoid of poverty and hatred, [inaudible] the increasing blessings of God Almighty and the righteous management of the perfect human being. Let us all join hands in amity in playing our share in the fulfillment such a decent new world. I thank you Mr. President, Secretary General, and all distinguished participants for having the patience to listen to me. Thank you very much. This page contains a single entry by writch published on September 23, 2009 7:32 PM. The 'Evil Empire' was the previous entry in this blog. Big Walkout is the next entry in this blog.